REMINDER: The Southeast Area Commander Meeting is tomorrow at 7PM. Join us! 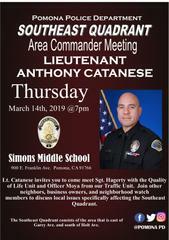 Lt. Catanese invites you to join him for the Southeast Area Commander Meeting tomorrow, Thursday, March 14th 2019 at 7PM at Simons Middle School- 900 E. Franklin Ave. The purpose of this meeting is to discuss local issues affecting the southeast area of the City . The southeast area consists of the area south of Holt Ave. and east of Garey Ave.
Stay connected with Pomona PD! Follow us on Instagram, Facebook and Twitter @PomonaPD.